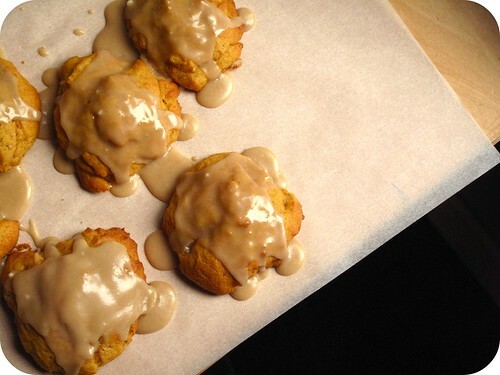 It's Pumpkin Cookie Time. I'm surprised it's taken me until October 14 to make them, actually. Of course, canned pumpkin is available any ol' time, so there's no real reason to wait for fall, except that I'm traditional that way. I posted this recipe a year ago, after I got home from a milestone solo retreat. After it all got sorted out, I hung out the shingle for my consulting practice, launched a website, and put the nails in the coffin of "Little Sarah," as Kathy says. It's a long story, potentially self-involved, but really wonderful in its way. The short version is this: I have gifts to give in the world, and it's time to give them. Hanging back for fear of failure doesn't serve anyone. And that story is getting old. These cookies never get old. Starting with Loretta's preschool has helped me realize that everyone--not just our family--is juggling a million things, hoping some little breeze doesn't come along to blow down their house of cards. In the middle of constant change and uncertainty (I know you have your own story), there is this decades-old ritual: opening the Libby canned pumpkin, turning the mixer on, watching the brown sugar icing turn glossy. We might as well eat well in this house of cards.